Our handcrafted wall easels are simple, lightweight, sturdy and easy to use. Great for painting large or working on multiple paintings at one time. An evolution of our original wall easels, our new designs have numerous improvements and refinements. The new box style masts allow us to custom build easels at much larger dimensions. Telescoping masts allow paintings to be positioned up or down while working, making it easier to reach all areas of the surface. 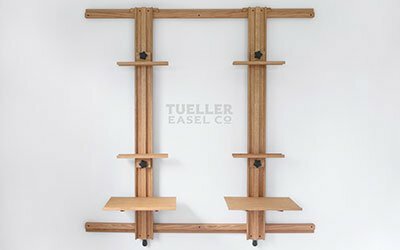 Tueller Wall Easels are handcrafted by Jason Tueller in his woodworking shop in Floyd, Virginia, USA. 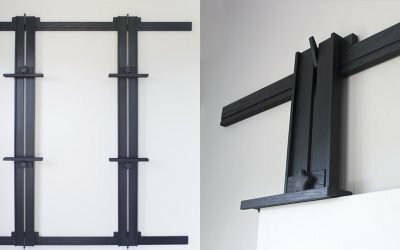 This easy to use wall mounted easel system is designed to accommodate large paintings and for working on multiple paintings at one time. Each easel setup can be expanded with additional masts, additional lengths of wall rail, work trays and several types of canvas holders. Custom sizes can be built on request. Available in Appalachian red oak, white oak and ebonized oak.